This updated version of U60 has now 1024 x 600 screen and 1.2Ghz VIA cpu..
Their design has changed too, but the mini mouse pad is still there. 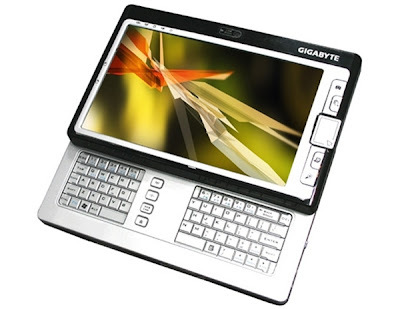 I'd like Synaptics pointer more..
Gigabyte will be at Cebit next month so we should see more of it then. i wonder abouthe thickness. the u60 was the fattest umpc . Is there any information about price? This device looks so nice. I totally want the gigabyte M704. I just wish it had the sweet eeepc price on it. Considering the U60 is $1,144.95 I don't think this will be a cheap device. Heck I didn't spend more than $1000 on my desktop replacement dell. What's with all of these UMPC's having VGA out? HDMI so we can drive modern displays please.